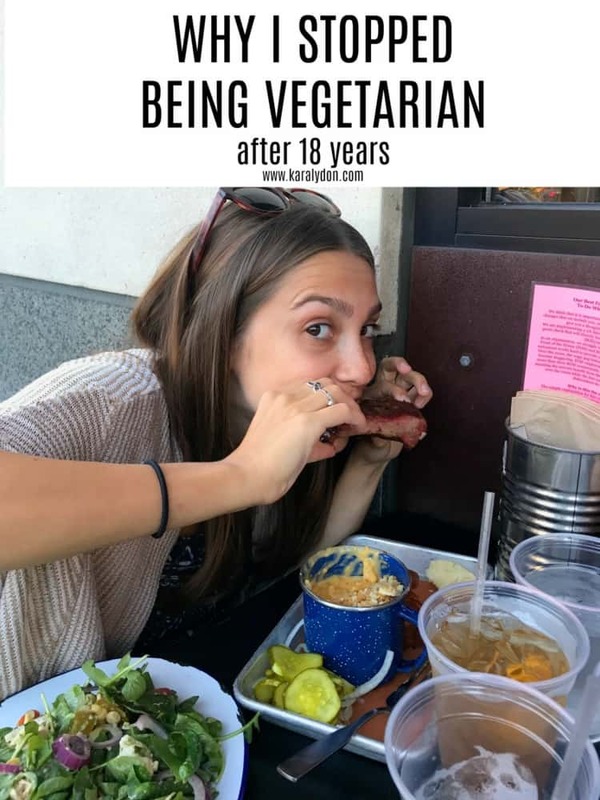 Sharing a personal story today on the blog about why I stopped being vegetarian after 18 years and started eating meat again. Hey guys…this blog post has in the making for about six months now. I’ve been waiting to tell this story until it evolved to a point where I felt there was a story to tell. You see, six months ago I ate my first piece of meat…in 18 years. And last month in Europe, I was eating meat almost on the daily. So, how did I get to this point? What did my journey to eating meat again look like? In order to understand this, I think I have to start from the very beginning. A very good place to start (pardon the Sound of Music reference – Salzburg was one of my stops on my trip last month). The Younger Years. Becoming a Vegetarian. When I was a kid, my family would take a one week vacation every summer as tradition. One summer, when I was 11 years old, we drove to the finger lake region and stayed at a motel called Chalet Leon at Hector Falls in Seneca Lake. This place was the best as a kid. I remember they had a path behind the motel that led straight to part of the waterfall that you could walk underneath. My Dad would literally bring his shampoo with him in the morning and shower under the falls (no joke). We would take the path further down and skip rocks in the lake. Well, my Dad would skip them. My sister and I would just not-so-gracefully chuck them into the water. One morning at Chalet Leon, my parents asked the motel owners what they could do with us in the area that would be “kid-friendly”. They said oh, there’s this farm nearby you could take them to. Great. A kid-friendly farm, probably a petting farm. Perfect. 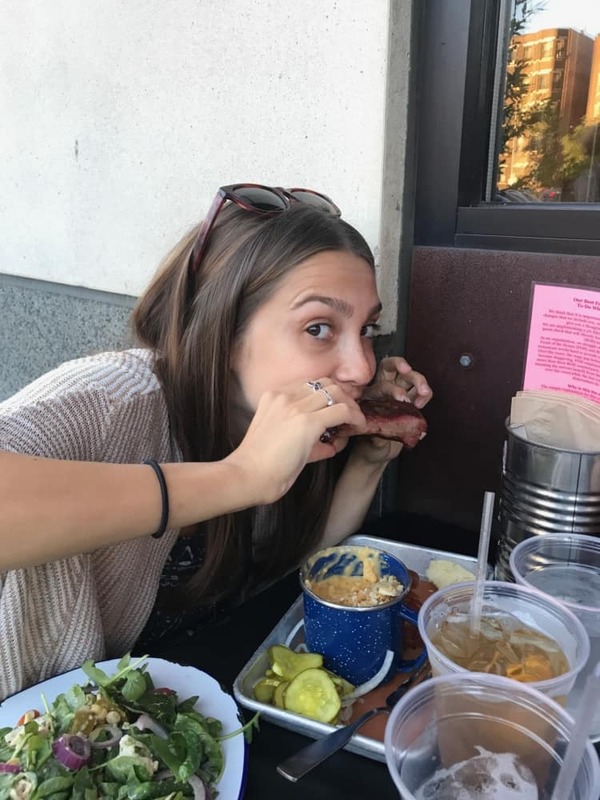 So we went to the “farm”, which turned out to actually be a farm sanctuary, which provides shelter to over 500 animals rescued from poor factory farm conditions, exploits factory farming, and serves up vegan dogs on a platter (literally). I saw some really horrible things at this farm (I’m going to spare you the details in case it’s triggering to anyone reading). Needless to say, the sanctuary was not the kid-friendly farm my parents had envisioned. As an animal-loving eleven year old, the experience not only greatly disturbed me but it stuck with me too. About a year later, or maybe less than that, one evening at dinner, my Mom served lamb chops and I remember staring at them sitting in their pool of red juices and being so turned off, remembering my experiences at the farm, and I said to my parents very indignantly, “I’m not eating meat anymore.” Their first reaction was defensive and eventually they succumbed, I think saying it would be a short phase or something like that. Eighteen years later, it obviously turned out to be a longer phase than they expected. Getting Curious through Intuitive Eating. That curiosity led me to back to the eating disorder that I developed about a year after becoming vegetarian. It’s hard for me to believe that this timing was merely a coincidence, especially with the knowledge that I have now about eating disorders. You see, it can be common for restriction to start in the form of something that’s more socially acceptable like giving up meat or giving up all animal products and then to escalate from there. I was talking about this realization with my parents recently (as they were shocked that I was eating meat again) and my Mom reminded me that shortly after I stopped eating meat, I also gave up dessert too. So, one restriction led to another, and another, until it developed into a full blown eating disorder. She also reminded me that a couple of my good friends at the time had also stopped eating meat. So perhaps it was less about the animal rights and the trip to Farm Sanctuary (as I attested) and more about control and fitting in with peers. As I recovered from my eating disorder, my vegetarianism stayed. And it stuck around throughout high school, college (despite a few drunken nights eating chicken fingers and wings), and up until now as I embark on the big 3-0. And I certainly don’t think that I’ve been stuck in disordered eating for the last 18 years; I think it just became a way of life for me. This is how I eat. This is how I’ve “always” eaten. I never thought twice about it. Until I became immersed in intuitive eating and gave myself the space to get curious about it. And when I got curious about it, I realized that, you know what, I really liked the taste of meat as a kid (and the fact that I was binging on late-night chicken fingers in college leads me to believe that I liked it then too). But I do still have some beliefs and values that support plant-based eating. For instance, I do still deeply care about the treatment of farm animals. I do still believe in the health and environmental benefits of a more plant-based lifestyle. But I’ve been able to challenge those beliefs too. Like if I care about the treatment of farm animals and oppose factory farming, then why can’t I purchase my meat from the CSA I get my produce from where I know how they treat their animals? And if I care about the health benefits of plant-based lifestyle, then why can’t I still eat mostly plant-based (and my definition of plant-based does not mean vegan) but still allow myself the flexibility to eat meat when I’m craving it or when something sounds really appetizing. And that’s the beauty of intuitive eating. It’s not black or white. It’s not all or nothing. Black and white thinking is diet mentality. I either eat meat or I’m avoiding it all together. I’m either avoiding carbs or I’m binging on them (another example of black and white thinking). But we can exist in the shades of grey. It doesn’t have to be all or nothing. I can continue to eat in a way that feels good to my body and that respects my values around animal treatment but I don’t have to be so rigid about it. I can give myself permission to eat whatever it is I’m craving, even if that includes meat. The past six months have been my time to experiment. To see if I even like the taste of meat. To see if I like some forms more than others. To see if I even wanted to get back to including meat in my diet? It started with taking bites of Steve’s stuff. Bite of a braised short rib grilled cheese sandwich (um, yum. ), taste of a turkey bacon sandwich, sharing his apple cider glazed chicken. And when I would take a bite, a smile would come across my face, and Steve would be like your eyes just lit up as if life was just coming back into you. But, it’s true. I enjoyed it. Which also supported the idea that maybe it was time to challenge some of these “rules” that I had created oh, so long ago. 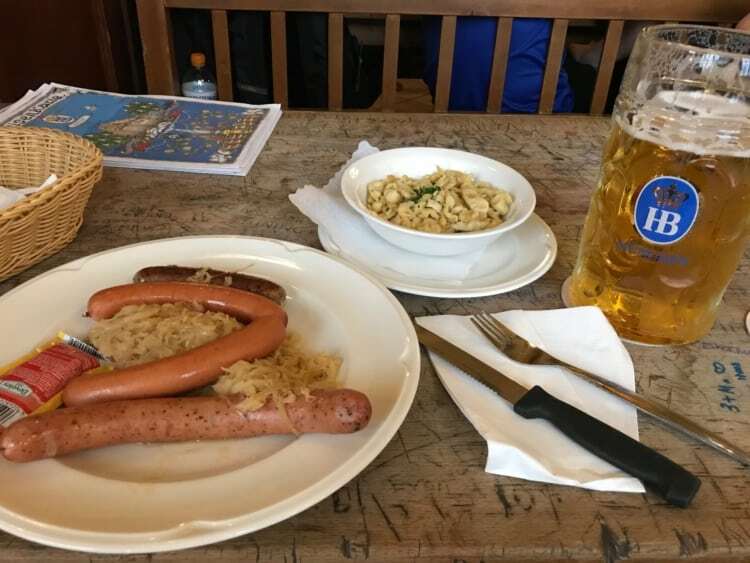 When I went to Europe last month, I traveled to places that are traditionally very meat-centric: Prague, Berlin, Munich and Salzburg. Now ya’ll know I love to travel – exploring a new place is one of my biggest passions. But for me part of that exploration is experiencing the local food culture. And I felt like I couldn’t truly do that without eating meat. 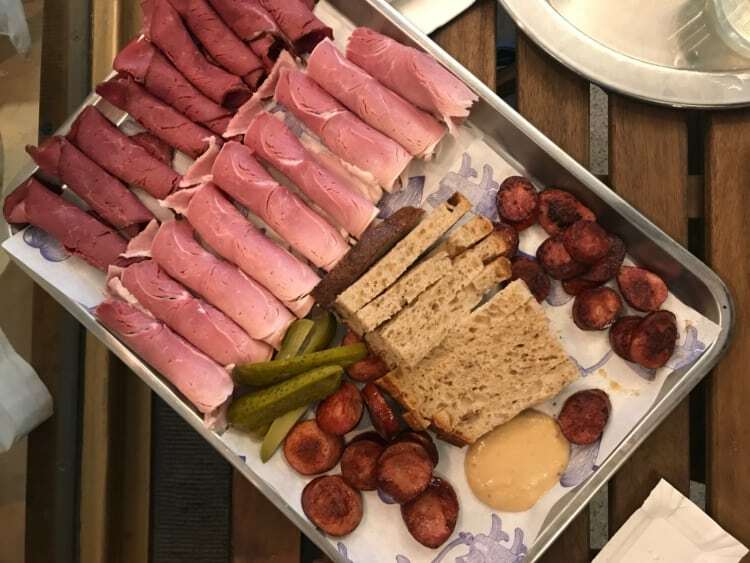 So I tried their staple dishes: sausages, hams, beef goulash, pork schnitzel…and discovered that I liked some more than others (not a fan of sausage right now). And there was a sense of pleasure and satisfaction that came along with being able to enjoy the local fare while traveling through these cities (stay tuned for an intuitive eating while traveling post coming in the near future bc I feel like that’s a whole other topic). I’m sure some of you are wondering: do you feel any different now? Do you have more energy? Are you more sluggish? And no, I don’t really feel any different at all. Which reinforces my belief that maybe how we feel has less to do with our food choices and more to do with how we take care of ourselves in other areas of our life (relaxation, self care, mental health, etc.). So what does this all mean for the blog? Well, I’m still going to be eating plant-based meals and seafood so you can expect to still see vegan-friendly, vegetarian-friendly and pescatarian recipes. In fact, that likely will still remain the bulk of what you see here. But I want this to be a space where all foods fit. So I’m going to be talking about all the meals I eat. Not just the ones that fit a plant-based model. In my Europe recaps, you’ll see the meat dishes I ate. 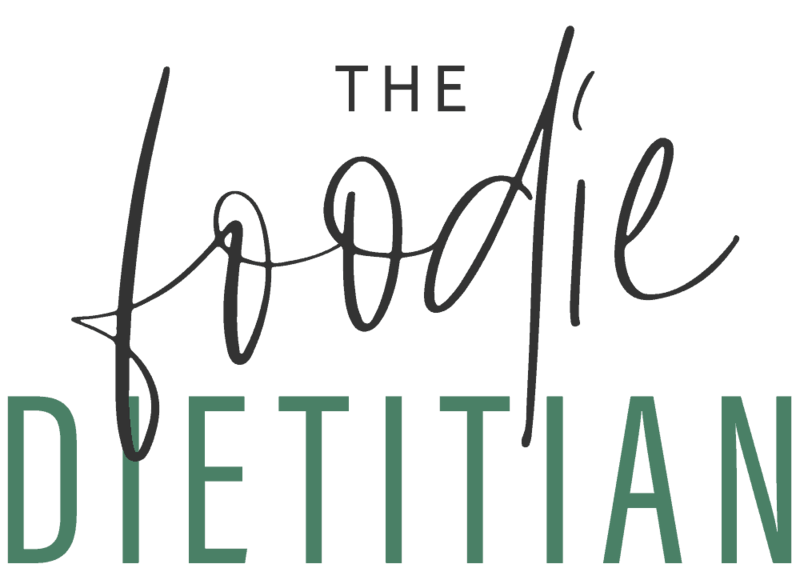 I want the blog to be a space that promotes flexibility, not rigidity and I hope that you’ll stick around for more intuitive eating posts as I aim to promote a healthier relationship with food and our bodies. What Does This Mean For You? Nothing. Unless you want it to mean something to you. 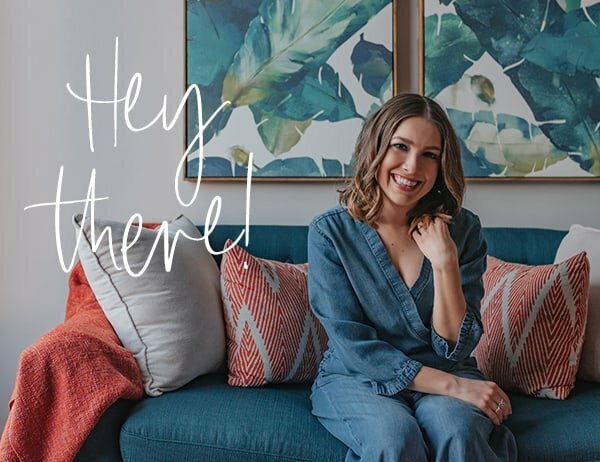 The aim of this post was simply to share a piece of my personal life with you and how it translates to my professional life and the work I do with my clients. 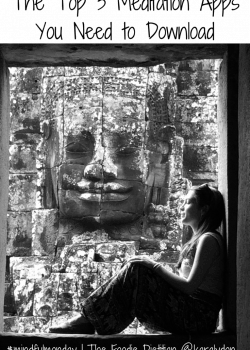 But if you do want to take away something from this post, I invite you to practice compassionate curiosity in your own life. Maybe this applies to food and you start to get curious about your own “food rules” or maybe you get curious about your career, your relationships, your self-care, whatever it is, without casting judgment on yourself. Curiosity is a beautiful thing as long as we’re not judging or feeling shameful about what comes up. 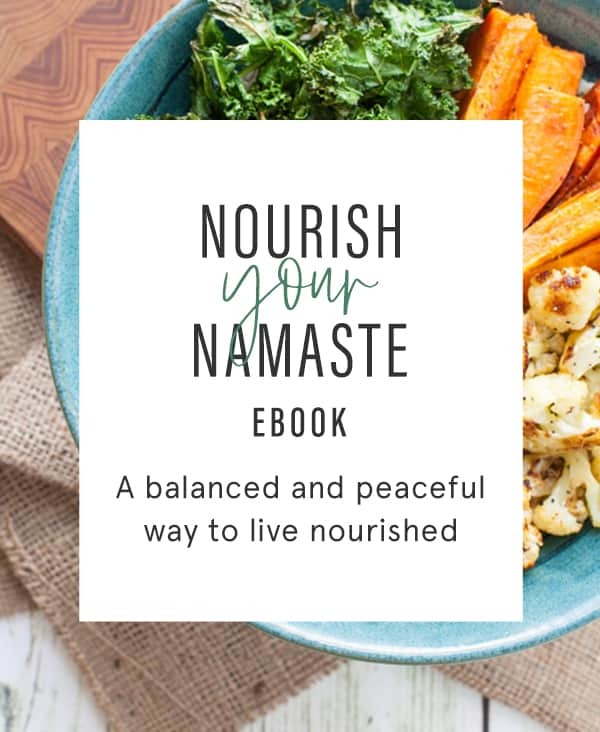 In my e-book, Nourish Your Namaste: How Nutrition and Yoga Can Improve Digestion, Immunity, Energy and Relaxation, I talk about the yogic principle of ahimsa, which stems from the first of the yamas, and translates to non-harming or non-violence. Some misinterpretations of ahimsa have led yogis to believe they shouldn’t eat meat. But the important piece that is missing with this interpretation is that non-harming also means non-harming of the self (in addition to non-harming others). If you decided to give up meat and realized that you were losing weight, felt weaker, tired, and low energy, then you would be doing harm to yourself by adopting a vegetarian lifestyle. No matter what eating lifestyle you choose, make sure it’s not causing you harm (mental or physical). If you find you feel amazing by eliminating meat, by all means respect that insight and go veg. But don’t go plant-based-to-the-extreme for the sake of the Yoga-Sūtra at your own expense. You’d only be doing yourself more harm than good. Bottom line: You do (what works for) you. Don’t ever feel like you have to put a label on your eating patterns or defend your eating decisions as long as you’re being really honest and curious with yourself about your intentions behind them. I’d love to hear from you about how or if curiosity has played out in your own life. 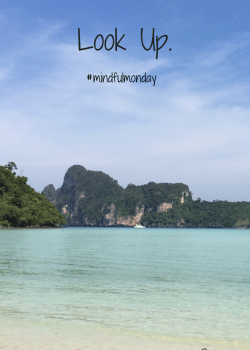 For more Mindful Monday inspo, check out the posts below! Thank you for sharing, Diana! I totally agree with you that the “journey” never ends :). I’m glad my story helped to provide some comfort and affirmation for you <3. This made me so happy to read because you spoke the truth! free of judgment. I have had a long weird journey, started off as a vegan, then vegetarian, and now pescatarian. I started because I felt conflicted about things that you mentioned and became so uptight with what I can or couldn’t eat. I have been thinking back and forth for a bit over a year on how much I missed eating foods that I grew up with or having that cultural connection with family through food. You have allowed me to understand and realize that who cares if someone judges me, I want to eat meat but still remain a healthy lifestyle. Thank you so much for posting this. I (re)discovered intuitive eating a few months ago and have been working through Tribole and Resch’s book, and making action points for myself to really think, and feel, about the way I choose food. I’ve been vegetarian for 23 years (with the odd bout of pescatarianism, and I too ate chicken, for a couple of months about twelve years ago), and for the past week or so, I have started to become curious about eating meat. I’m so conflicted about this. All the reasons I became vegetarian still exist for me (animals being sentient beings and not here for our ‘use’, their mistreatment), but for the past week I feel like I am *really* feeling my hunger, deeply, and am wondering whether eating meat, finally, might be how I help satisfy it. Reading your article was so helpful. Your non-judgement of yourself is exactly where I want to be, and is the path I’m on, I hope. I loved what you wrote about ‘testing’ food. My curiosity feels very academic at the moment, I haven’t put it into practice yet, so it’s really helpful to read about those who have had the courage to do just that. Thank you for sharing your story so beautifully. I finally found what I was looking for. I am a vegetarian (for 8 months but I’ve been one in the past for one year then gave up) who just a few weeks ago began taking care of her and her eating habits and since last night I’ve also began to crave meat. I’ve actually beacame one because of my digestive problems because I didn’t ate lean meat only, I used to eat salami, ham, sausages and fatty meat so no wonder I was having trubles going to the toilet 🙁 so I guess my point here is that I was having a really hard time trying to figure out if I should start eating meat again or not and your post kinda made me to make up my minde. I ‘ve realised that once I start eating meat again I still can have my vegetarian days and I don’t have to stuff my face with a lot of fatty meat. I am still not sure though…there is a battle in my head and I don’t even know what I am fiting for..
Hey there, it sounds like you feel really conflicted about it. Just remember there is no “right” or “wrong” decision and I would just try to get in touch with your values and intentions for being vegetarian. I know it’s a tough choice! Thanks for sharing. I recently switched from a vegetarian diet when I returned home for a while since someone else was cooking meat for me (main reason I went vegetarian) and honestly, I felt so much better! I am not sure if other people have the same digestive issues I had with eating tempeh, beans and tofu, but all gone now! Honestly, it about eating what makes you feel good! Totally, Tal! Eat what makes you feel GOOD. Period. This is such a great post, Kara. I resonate on so many levels, from the disordered eating, the food rules, avoiding meat, and then finally getting curious and testing, and continuing to test whether what I’m avoiding is because I simply don’t like it, or because I’ve created a belief about it being bad. For now for me, I rarely eat more than a taste off my husband’s plate before I decide “no thank you,” but knowing my tendencies, I tend to keep trying out these “no foods” every now and again. I love that you are sharing your experience and by doing so, can hopefully help so many others learn to eat more intuitively in the way that works best for them! Thanks so much for sharing, Rebecca. It sounds like we have such similar stories. Such an important lesson to keep trying these “no foods.” I sure hope I can help people to learn to eat more intuitively! I love this post so much. I was vegetarian-borderline vegan in college and then I realized that… what I was doing wasn’t balanced at all. Under what circumstances is spinach and rice for dinner (notice – no protein at all), or blowing through a whole box of cereal AND crackers in three days balance? One, I learned a whole lot more about nutrition which impacted my decisions. But two, I realized, I’m kind of a crummy vegetarian. I actually hate tofu, in fact there are a number of plant-based proteins I don’t really love. I found I do better when I have the majority of my meals as plant-foods (I usually eat at least one meal/d vegetarian, with beans or milk or Greek yogurt as my protein) and include a small amount of animal meats/protein at my other meals. To me, it’s still plant-based. The majority of my meal is comprised of plants. Thanks for opening up! I love this, Stacey! When I first became a vegetarian, I was one of those unhealthy vegetarians too, subsiding on pop-tarts and carbs and barely any protein! I love the more flexible definitions of plant-based too. I agree that plant-based eating can include modest amounts of meat and dairy! Thanks, Kara, for sharing this personal story. You do you! So interesting Kara! Loved the part of your dad bringing the shampoo to shower in the waterfall. Thanks so much for sharing your story and I can’t wait to see what you come up with! Haha yes. If you knew my Dad you would know that’s a total Poppa Lydon move. Thanks for reading my story, Sara! This was such an interesting post to read, Kara! I stopped eating meat several years ago and for the first time in the past few months I’ve been tempted by the smell and allure of meat — and it’s such a strange feeling. I’m not yet ready to try it again (part of me feels like I don’t even know how! ), but it was so comforting to read about your journey, and know all is OK. As a dietitian I feel like we’re often supposed to have it all figured out and know all the answers when it comes to food, but thank you for showing that our own journeys can still evolve too! Thanks so much for this post! This bit was like a lightbulb moment for me. I’ve been a vegetarian for 15 years, since I was 13. I had a couple of friends who were vegetarians, and I was an animal lover, so I announced I would no longer eat meat, either. I never particularly liked most meat/meat dishes, so it wasn’t a huge sacrifice at the time, and the only real issues I’ve had around it have been awkward moments at social gatherings (pro tip: If you’re a veg*n, make sure you have an answer that’s not “MEAT IS MURDER” for Christmas with your boyfriend’s farmer grandparents!). However, I do have a lot of disordered eating habits around things I actually like (think trying to cut down on carbs and then bingeing on bread). Reading this makes me wonder if my vegetarianism, even though I don’t miss eating meat, was still an attempt to restrict from an early age. And as I’ve gotten more interested in intuitive eating, I’ve been questioning the rigidity of my vegetarianism. Things like: Would it be okay if I only ate ethically-sourced meat? or, What if I continued to eat the same plant-based meals in general, but shared a platter of bacon-wrapped dates when out for dinner with my friends? And, sometimes, the kneejerk answer is, ‘But what will people THINK?’ What will people think of me, if I’ve been saying I’m a vegetarian for 15 years and then they catch me eating poutine? What will people think of me if I have the veggie burger at a barbeque but grab a couple of scoops of a chicken salad? And making my food choices around what other people think isn’t any way to live my life. I’m not saying I’m going to suddenly start eating meat again, but this post came at a time when I’ve been thinking about meat and intuitive eating already, and I appreciate it. This is a great article Kara and I appreciate your sharing such a personal journey. I have been in and out of eating vegetarian, vegan, raw food and omnivorous diets for years. I’ve raised farm animals for meat production (wagyu cattle [for kobe beef], sheep, lambs and heritage pigs) and also gave up raising animals for consumption. I’ve eaten a junk food vegan diet when university coursework and job demands were greatest. I’ve also noted how much better I feel when I take the time to eat a balanced diet full of fruits, vegetables and whole grains. I’ve participated in, as well as admonished fad diets. I’ve grown a lot of organic food, learned some aspects of commercial food production and am thoroughly enjoying learning research decide to occassionally enjoy a bite of steak, I’m going to do so with my eyes wide open to the impact of tskills and evidence-based nutrition in my final year of my dietetics degree. I’ve analyzed my food philosophy closely over this past year from an amused out-side-looking-in approach. The pendulum has stopped swinging and I’m at peace with a balanced, fully-aware, non-judgmental intuitive approach. I like Michael Pollan’s adage, “Eat food. Not too much. Mostly plants.” As a recovering “black and white” thinker (and eater), it is a joy to have reached a place that I feel honors my left-brained just-the-facts ma’am as well as my right-brained intuition, creativity and sense of pleasure in all things tantalizingly aromatic and delicious. I am a conscientious eater and hold myself responsible for the impact of my choices. Meaning, if I hat decision. Thank you Catherine – I appreciate you reading and sharing your experience and thoughts on the subject so beautifully. It sounds like you’ve done your share of “experimenting” with different ways of eating too and I’m so glad to hear that the pendulum has stopped swinging and you’ve come to a place of peace with your approach. This is such an interesting read! A really good friend of mine had been vegetarian for 20 years and then decided to try adding a bit of meat when she was pregnant since she couldn’t stomach much else. After giving birth she decided to continue eating meat and hasn’t looked back. It’s good to let our ways of eating evolve as we evolve as well but to also allow yourself to try new things if that’s what your mind/body are telling you. I find your story very interesting and almost identical to mine back in high school. I went on to get an MSW w a specialization in ED and worked in the field for many years. I have now been a vegetarian for over 30 years and can’t really ever imagine eating meat again. Thanks for sharing! How interesting. Thanks for sharing, Deborah! I believe for many being vegan can be a socially acceptable way of restricting. As someone who has a heart for preventing disordered eating, flexibility (I have found) can be a key characteristic to having a healthy relationship with food. I couldn’t agree more with both sentiments, Elaine. Flexibility is key for eating disorder prevention and recovery. Thank you for sharing. I applaud you for bravely sharing your story, Kara! I’ve been vegan and vegetarian before. Now, I eat what I want but like you, it’s mostly plant based + fish. People can be very judgmental when they’ve labeled you a certain way and you go against that image. So kudos to you, Friend! I work with college-aged women and many want to be vegan because it’s “cool” but struggle because they love meat (and also don’t know how to eat to nourish their bodies on vegan diet). I try to help them get beyond the label and eat what works for their bodies. Thanks for sharing! Awe, thank you Marisa! That means a lot. Totally. I was definitely apprehensive about the judgements that would follow from this post since I’ve had that “label” for so long but I’ve been overwhelmed by all the support and love I’ve received from sharing my story. Fascinating journey you’ve had. Two of my daughters are vegetarians and I definitely have my radar up about the motivation for the change, particularly since I see a lot of their friends experimenting with various diets and restrictions. So far, they seem pretty healthy and balanced about it. And I hope they know this doesn’t need to be forever if they choose to go in a different direction at some point. I’m sharing your post with them! Thanks for sharing my post with your daughters, Katie! I hope they find it helpful. Getting to the root of the intention for these decisions is so important. This was a thought provoking post. I stopped eating meat when I was six, and I made this choice when I realized where meat came from. I just did not want to eat the flesh of other living animals. Once I became a mother, I discovered that my child was a meat lover, and started including meat based dishes in our diet. When I found sources of meat that came from ethically raised and harvested animals, I became much more comfortable with serving meat based dishes and willingly paid a premium price for such food despite our low income. I had discovered that I felt better including meat in my diet when I started meditating, oddly enough, as that is when many people start to reject the concepts of eating meat. 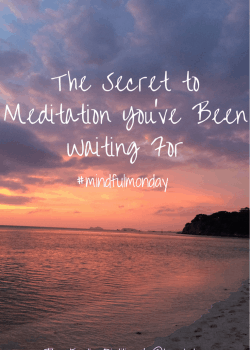 When I asked my meditation teacher about the timing, I was told that some people have trouble feeling grounded in the physical plane, and that eating meat helps resolve this problem, which is why a need for meat might emerge after starting a meditation practice. But I was not comfortable with eating meat until I had access to ethically produced meat. And I am still repelled by “bloody” meat dishes, or animal fat. It will be interesting to analyze the source of the latter two dislikes. That’s so interesting, Susan. I’d never heard that before about the connection between meditating, eating meat, and feeling grounded. Thank you for sharing your experience. Loved this post, Kara. I can just hear the freeness in your words, and it so beautiful! Awe, thank you Shawn! That means a lot.